Probiotics are beneficial, live microorganisms (in most cases, bacteria) that are similar to those found naturally in the human intestine. Also known as "friendly" or "good" bacteria, probiotics are the cornerstone of any successful health program because they restore a healthy balance between friendly and bad bacteria in the intestinal tract, a balance that is critical for the health of the entire body. Probiotics are associated with treating everything from IBS to certain forms of cancer, allergies, eczema, and even the effects of aging. Probiotics For Dummies reveals how taking the right probiotics—in the form of food and supplements— as part of a total health program benefits one's overall health, as well as improving specific conditions. This hands-on, essential guide features 20 probiotic recipes and gives you a step-by-step plan for infusing probiotics into your diet to improve the health of the GI tract, alleviate allergies and asthma, restore reproductive and urinary tracts, bolster the immune system against disease, enhance weight loss, and more. 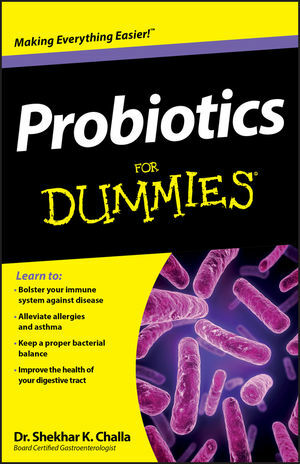 Probiotics For Dummies gives you everything you need to make informed decisions about adding probiotics to your daily diet.